Take amazing selfies with your pen! The Monteverde Bluetooth Selfie Pen syncs with your smartphone or tablet to take photos or videos. No more long arms in the shot because the pen remotely controls your phone’s camera. Just place your phone in a secure location where it is facing you and your friends. Try a cell phone stand or charging station. Then step back, so all of you are in the picture. Push the button on the pen and you’re done. It’s great for indoors and outdoors. The battery will last for up to 100 hours and the pen will go into standby mode after 2 minutes of inactivity. 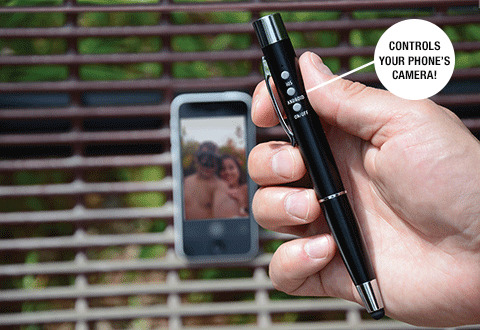 The Bluetooth Selfie Pen not only takes photos, but it is actually a pen. You can use it as a ballpoint pen or stylus. It has a USB connection port for charging when not in use. Press the on/off button. A blue light will flash after 3 seconds. On your device, go to the Bluetooth settings and connect it to LY-ZPQ802. Go to your device’s camera or video. Take a photo by pressing the IOS or Android button on the pen.